It’s Friday afternoon, and you’ve just been told about an event on tonight that you really want to go to. But it’s 4pm, you’ve got to be there by 8, and you need a new dress. Sound familiar? As much as I love dresses, I hate shopping for dresses. Normally I’ll have in my mind an idea of what I’m looking for but can’t find it in store and end up with something that looks alright – but just… alright. Nothing amazing, nothing special, just something I grabbed at the last minute going around House of Fraser. So many of my favourite shops have their own online shops, but who has the time to look at each site, each dress, each colour? This is where sites like find-me-a-dress.com come in. Find-Me-A-Dress.com allows you to choose the style of dress from prom, day, maternity, party, wedding, work and cocktail, and then narrow down the specifics of what you need – size, length, fabric, shape, colours and price. I think this is a really great idea – although there are a few things I’d change about the selection process, I like that it shows you dresses that you probably wouldn’t have chosen yourself. Sometimes, the outfit you’d never usually choose yourself turns out to be your favourite one! With the party dress “season” coming up, this is such an easy way to find something new and glamourous. Ooh, now I’m all excited about dresses again! Any plus sizes? 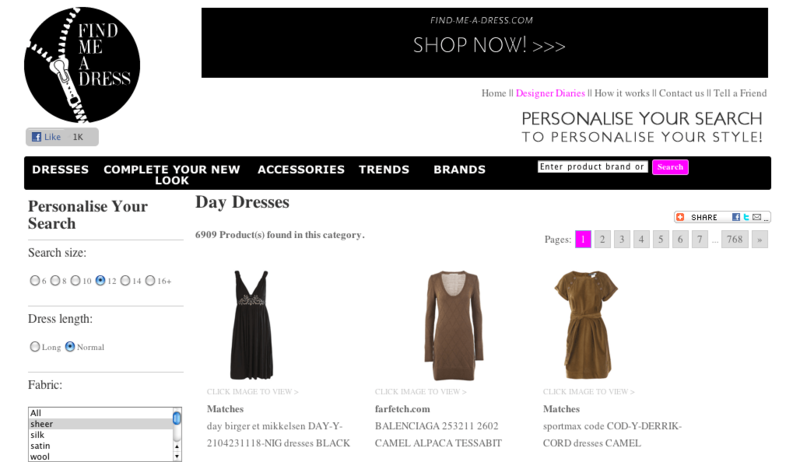 I don’t understand – does it search via online sites I.e searches Next,Topshop etc all in one hit?? Or it’s a separate store altogether? It has a 16+ option, which is usually plus sizes, but I don’t know.